Local Drug Store Holistic Care – Gift Card Giveaway! Congratulations Heidi! I will be emailing you soon. In case you are wondering how the winner was picked I used the site Random.org and entered in the number of comments and let the site pick the winner. The winner was comment #17. I feel fortunate to have a Pharmaca in my town. It’s the kind of drug store where you feel a little more confident about your purchase than you might at one of the big box store pharmacies. The staff really takes time to get to know your needs and they offer useful suggestions. The store is also filled with environmentally friendly products. Keep reading to find out how you could win a $50 Pharmaca Gift Card! 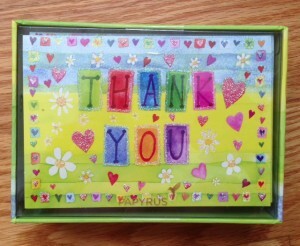 Pharmaca also carries a line of beautiful greeting cards like these sparkly Papyrus Thank You cards. Be sure to ‘LIKE’ Sally Around The Bay on Facebook! PS. Pharmaca is also offering a $10 off a $40 purchase coupon to MY readers. Download the coupon here. Thanks Pharmaca! I LOVE Pharmaca and there’s one near me! Pharmaca is my source for all supplements (and I usually walk out with a snack or two as well). The staff at both the Mill Valley and Novato stores have always been super helpful! I always feel welcomed and heard at Pharmaca! What a terrific resource! I love browsing (and shopping, because I do buy more than what’s on my list) at Pharmaca. Super friendly staff there too 🙂 Haven’t been to the one in Novato, but now that I know it’s there, I’ll drop by. Was just there the other day! Yep, one sort of near me! Pharmaca is one of my favorite stores. I am picky about what I put on my skin, and they have products I can trust. Hope I win! I love Pharmaca! So fun! I have a Pharmaca not too far from where I live. As I run out of things I have been going there. It feels really good to buy something I know for sure hasn’t been tested on animals. A small step in trying to live more consciously and with compassion. Thank you for your efforts in giving us this choice. More people should know about you! I wish there was a store in San Anselmo! (; I will check out the website and pop in to the store closest to me. Thanks Sally K! Looking forward to experiencing Pharmaca! Here is why I’m grateful for Pharmaca: it is the only store in our town where one can still purchase a product called Breath Assure (now “Mint Assure”) which is a parsley oil based gel capsule that one who has terrible garlic or onion or cumin or beef breath can take to eliminate said breath. It is one of the reasons my husband and I are still happily married. Thank you, Pharmaca. 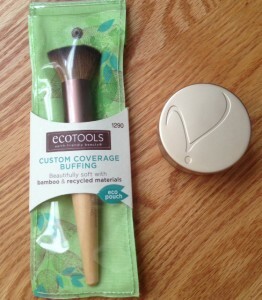 I love to discover new natural beauty products. Looking forward to checking out the Boulder stores soon! I have noticed from your blog posts that California has a lot of stores that we do not have in Tennessee. It’s become so important for me to find products that are healthy for me and the planet! Thank you Pharmaca! I have the worst contest luck but maybe it’s my time! What a great way to remind me that there are some back to school items I need at Pharmaca! must stop by Rockridge next week! What a smart way to spread the word about a great company. Kudos! Thank you for the giveaway, I’d love to get some Burt’s Bees products! i have a pharmaca near me, but have never been. would love to try, thanks!